We frequently see questions regarding TPMS rebuild kits so we decided to put this post together to help answer some of those questions. First, a brief overview on the two types of TPMS systems (indirect and direct) that are found on today's TPMS equipped vehicles. An indirect TPMS system measures tire pressure from the rate of tire revolution via the wheel speed sensors that the anti-lock brake system uses. A direct TPMS system utilizes a pressure monitoring sensor within each tire/ wheel assembly that transmits tire pressure to the TPMS control module. It is this system, which is also the most common, that need TPMS rebuild kits. What is a TPMS rebuild kit? A TPMS rebuild kit contains all of the necessary components to rebuild the valve portion of the TPMS sensor of either a metal or rubber sensor. The actual sensor portion is not serviceable and goes untouched. What's the difference between a metal sensor and a rubber sensor? What is the difference between a metal sensor and a rubber sensor rebuild kit? When do I need to purchase a rebuild kit? Rebuilding the valve portion of the TPMS sensor ensures an air tight seal and reduces the chance of early sensor replacement due to normal wear or corrosion. We recommend a new rebuild kit anytime the sensor is removed from the wheel and when signs of wear or corrosion are present. What does a TPMS rebuild kit cost? Prices range anywhere from $3.00 to $14.00 depending on the manufacturer and type of sensor. TPMS rebuild kits are sold per sensor (4 sensors would need 4 rebuild kits). How do I know which rebuild kit I need for my vehicle? 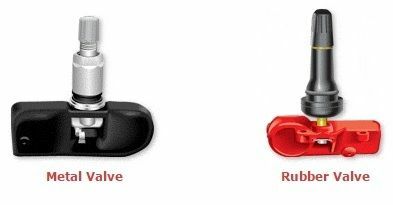 To determine which rebuild kit is correct for your vehicle, you'll need to look at the valve stem that's currently installed. If it's rubber, you'll need the rubber valve stem rebuild kit. If it's metal, you'll need the metal one. We hope this information provides you with the knowledge necessary to keep your TPMS sensors functional and your vehicle running safe down the road. If you have further questions regarding TPMS rebuild kits, feel free to ask them here or contact your local Discount Tire. For more information on TPMS and other tire and wheel related topics, please visit our Information Center. Last edited by Discount Tire; 12-18-2015 at 11:14 AM.